A graph of the citations made among academic papers can reveal information about how influential a particular paper or person is within the academic publishing community. 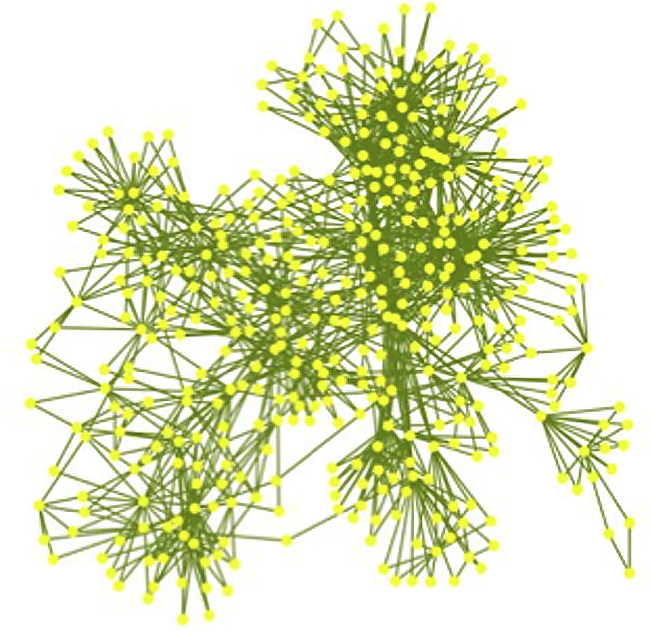 Such a graph is a description of networked power and network power, that is, the description of power holders within networks and the network structures and effects that support and reinforce that power. An understanding of these forms of network* power is undeniably useful. For example, graphs like that in Figure 1 can assist in identifying the individuals and institutions who wield power within a network. Networked and network power, however, do not explain the formation of their own power, the network-making power governed by programming and switching. The digital features of the Web render PageRank fundamentally different from the print-based academic citation practices Larry Page and Sergey Brin used as the model for their algorithm. Because the Internet is digital, it allows for easier network expansion and reconfiguration than did pre-digital networking technologies. One manifestation of this expansion and reconfiguration is that the Web has low barriers to participation compared to print publication, making it easier for users to post nearly any content they like whenever they like. Consequently, Internet content is dynamic—new pages and new links are constantly being added at a high rate—and it was this dynamism that eventually rendered web directories ineffective. Because the Web is constantly in flux, it is practically impossible for humans to keep up with changes online, and automated tools are needed to handle the volume. Practically, the digitally of Google’s network has specific effects on the way that a link-based citation network operates. Because of the constant expansion of the Web, an individual site’s PageRank can always be changing. The addition of new websites and links on the Internet can alter a site’s PageRank making it necessary for the PageRank of any individual site to be constantly recalculated as Google’s spiders index the Web. More directly, this reconfigurability has allowed users to manipulate the PageRank of a site. Where the barriers to network formation in print-based publishing limit the direct manipulation of traditional citation networks—it is difficult to print academic documents and convince others that the citations in those documents should be considered part of a citation network—the ease of publication online, combined with the automated nature of quality measures like PageRank, allows for direct manipulation of those quality measures. The combination of the Internet’s expandability and reconfigurability and the use of automated tools like PageRank has had two significant effects on the operation of power within this network. The overwhelming popularity of Google’s search engine—powered in large part by PageRank—effectively programmed a network within the Web that valued pages that could generate many connections to other pages that could also generate many connections. The linking behavior that PageRank—and, by extension, Google—values is a form of switching, but the primary operation of switching power within the network programmed by PageRank is creating switches that will be recognized as valid by Google, and will subsequently influence search engine results. Astrid Mager (2014) has called this process algorithmic ideology, the construction of ideological outcomes—for example, valuing websites for their citations based on an academic publication model that values certain forms of production over others—through the application of these automated processes. The production of ideology via algorithmic processes certainly exists, but I argue that this outcome can also be viewed as a manifestation of network-making power. PageRank is an actor that helped generate the dominant program on the Internet, one that websites that wish to participate in that network must conform to in order to share in that power. That is, users must accept the switches provided by Google in order to participate in the network.